Harbouring a passion for music, travelling, sports and adventure hikes, the artist showcased her fantastical geometric worlds in beeswax sculptures, wax paintings and drawings at her recent debut solo show Fractal Future. 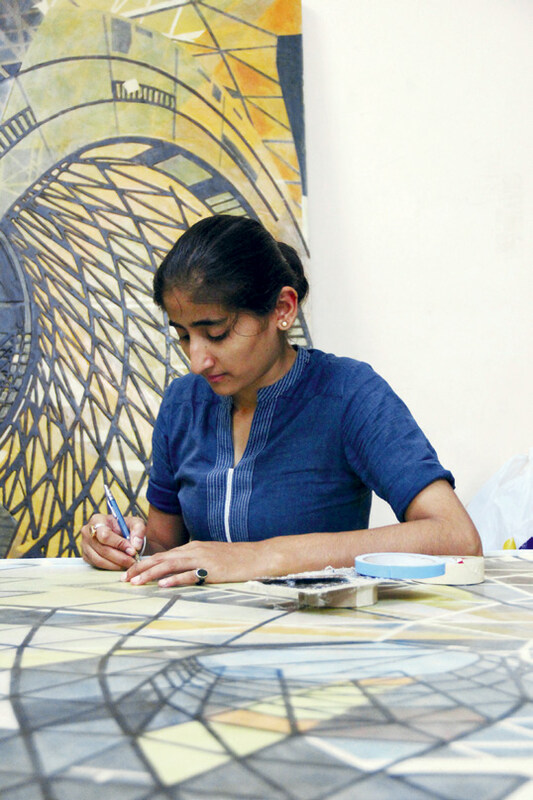 Embracing the unexpected and imagining the city of the future have long been sources of fascination for Bhagyashree Suthar. The triptych drawing named The Way To Morrow. This work is distinct in terms of content and visual appearance. The architect Zaha Hadid. I consider her a role model for showing such immense passion for her work and having the capacity to infect others with her organic fluid architectural forms. Hadid’s buildings certainly don’t look compromised; they are full of vigour and form, and new ideas. Antoni Gaudi’s consecrated Sagrada Família, which struggles to compress all of earth and heaven into its structure, with endless saints, biblical scenes, symbols and inscriptions on the walls of the church in Barcelona. I have to explore much more regarding my works in terms of visuals, techniques and information in this coming year. I also need to look at diﬀerent ways of using beeswax in my work and build massive structures with it.